When I retired, I began a mission to fill my time and avoid boredom. I was not really ready to retire and actually feared it immensely. Now in my sixth month of retired life, I cannot even imagine how I ever had the time to work! It has been so enjoyable exploring new interests and establishing a new kind of “busy-ness.” What do I do all day? Well, I do many things that I never had the time for when I was working. I have always been a crafty type. In the past, I have dabbled with quilting, cross-stitching, lace net darning, basket weaving, paper making, stamping, and scrap-booking. Over the years as I lost vision, I gave some of these activities up. But I have never given up on my need to have a creative outlet and am always in pursuit of the next craft I can do with limited vision. I discovered making rag rugs out of old sheets. I taught myself by watching YouTube videos. There are several ways to make rag rugs. 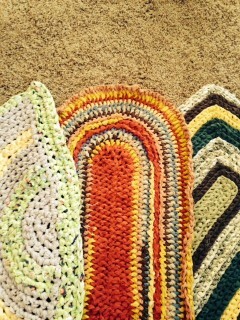 I settled on learning how to make Amish Knot, or toothbrush rugs and crocheted rugs. It is a large and tactile craft, so I can do it with very little visual input. I set about collecting bed sheets from the thrift stores in all colors and patterns. My husband helps me tear them into strips, using a technique from Aunt Philly’s YouTube video in which the whole sheet can be torn in just minutes. I use Aunt Philly’s toothbrush tool which I bought from amazon.com for the Amish Knot rugs and a Q hook, available at Walmart, to crochet rugs. At Christmas, I made rugs for all of my family and friends. I made round, oval, rectangle and half-circle rugs of all colors. For my son’s rug, I used an old Ninja Turtle sheet he used as a child for a special touch of nostalgia. I am obsessed with this new endeavor and am perfecting the art of mixing the colors and learning new techniques and designs. I love the homespun charm of this eco-friendly craft. The slubs and imperfections give character to each rug. There is no pressure to create a perfect rug…at the end of the day, it is a rug and will be walked on. Recently, I attended a bluegrass festival called “Bear-On-the-Square” in Dahlonega Georgia. All the vendors had to display handcrafted and locally made products. 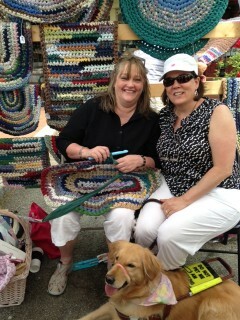 I came upon a booth named Rena’s Treasured Gifts and to my great excitement, met a fellow rug maker! 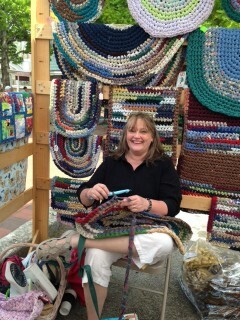 Her rugs were beautiful and there she was, working on another one in her lap. We chatted like old friends and swapped tips and ideas. Rena helped me with a few problems I was having and demonstrated how to fix them. I returned home, inspired to make more rugs. Maybe I too will sell them one day. Look at those beautiful rugs!